10,000 young engaged couples begin to arrive at St. Peter’s, Feb 14 2014. Have you ever seen a bluer sky? 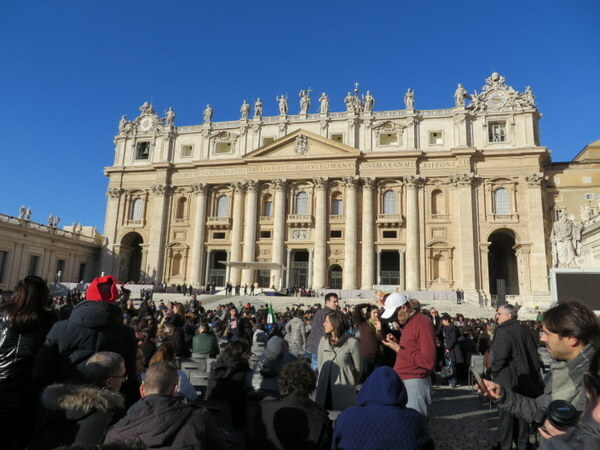 We headed over to Vatican City and found Piazza San Pietro filled with thousands of chairs and the basilica closed. Throngs of young people were arriving in couples. I asked a guard of the Gendarmerie Corps, “Cosa succede qui oggi?” (What’s going on here today?) It seems Papa Francesco invited 10,000 engaged couples to meet here on St. Valentine’s Day to consider their upcoming marriages with the theme “The Joy of ‘Yes’ Forever.” Sweet, but it meant we couldn’t climb the dome. You would think the St. Peter’s website would have information about an event like this, but no. A few days ago I checked and double-checked the hours for the basilica and the cupola. No word of 20,000 special invitees. Upon returning home, only with a Google search using “Vatican Events 2014” did I find mention of the event, and no mention of the closure. In fact the Basilica website insists it is open every day. Also, clicking on a link entitled Vatican Calendar of Papal Celebrations led me to the year 2008. Unfortunately this is what we often find in Italy: websites that are so out-of-date as to be useless. Perhaps I will write about Interweb Woes sometime in the future. It’s quite strange. 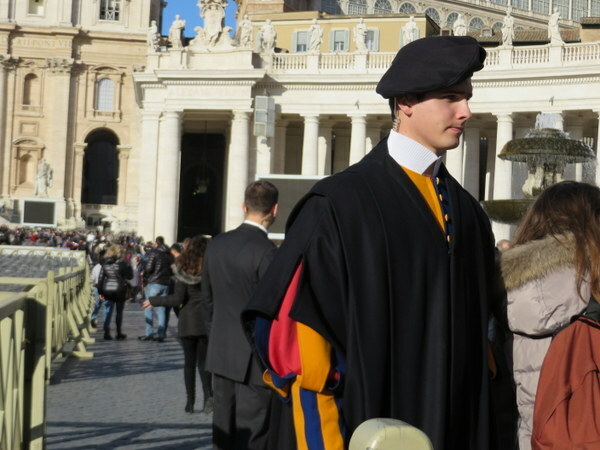 A handsome Swiss Guard redirects those who were clearly not meant to be a part of the Papal celebration. We were amused to find our Italian-ness taken for granted. Anyone who looked particularly non-Italian, as well as those who were clearly not in a couple, were quizzed by an English-speaking Swiss Guard about their intentions to see the Vatican Museums, then redirected to the museum entrance. We were assumed to know what we were doing, I guess, because no one challenged us to walking about in the crowd. We probably could have stayed and attended if we’d wanted to wait 3 hours. I am really curious as to how the 20,000 people knew about this event. I don’t read the Italian paper everyday, and I can only watch so much news before the politics make my head spin, but how did 20,000 innamorati from all over the world (says the Vatican) find out about this gathering? Perhaps word went out to parishes? All was not lost… Rome really is small and we knew a bus from the Vatican area to the Centro Storico would drop us near the Ara Pacis, so we headed to an Impressionism exhibit there. This exhibit is on loan from Washington, D.C., and I’ve meant to see it for the past 4 months it has been in Rome. It closes February 23, so time was short. It turns out a Friday morning was the perfect time to go. Imagine having an almost-private showing of Renoir, Monet, Cèzanne, Degas, Van Gogh, Seurat and more? Not once did I have to wait for someone to move out of the way so I could study a painting. The works were so intimately displayed I was tempted to reach out and touch the works. I had to put my hands in my pockets. Second stop was to be an obscure museum called La Sala Santa Rita where there is an exhibit about the Nazi occupation of Rome in WWII. A few days ago I checked and double-checked the days and times. We were good to go… until we arrived. There was a lecture going on, wall-to-wall people, no chance to see anything. Did I miss it on the website? Back home I checked: The English-language website says “no upcoming events.” The Italian-language site lists one for February 14: “Un incontro con Ray Caesar.” Figurati! See notes above about Italian websites. Humph! It was a beautiful sunny day, it was Valentine’s Day, we didn’t have to work, and we are together. We had a nice walk, saw great art, and tonight we will dine at the home of Italian friends we have been trying to set a dinner with for several months. Not bad for a day that didn’t go entirely according to plan! Sorry you missed il cupola, but I’ll look forward to hearing about it soon! John & I got to do it a few years ago… well worth it. Stairs are very narrow, though, and the marble’s worn very smooth in places. And you have the curvature of the wall as well… We happened to be climbing down (interior of dome) while a service was happening in St. Peter’s and it added to our experience (the prayers being chanted and the smell of incense). An amazing place. Now I want to do it more than ever! Perhaps one Saturday we will go ever-so-early and get it done! Maybe during mass…. Happy VD!! It is always good to be flexible…you never know what is around the corner. So far we have had 51″ of snow and more is coming!!! Happy Valentine’s Day! I think your day sounded delightful. I know the third time will be a charm for your climb to the top of the Basilica stairs. I’m glad I did it in 1965 when I was there. I will be looking forward to your report because I’m sure I’ve forgotten most of what I saw and learned!! I never know what is going on at the Vatican! But, last night I heard on the news about the Pope hosting couples! Carolyn, I can see you climbing those stairs! Magari I will do it soon! Thanks always for your great Oregon Zoo reports! Makes is feel connected. It is a chilly, wet day in Portland but the weather doesn’t dampen my spirits. You truly did have a totally unexpected yet wonderful day. I will look forward to the report when you do finally make it to the top of the Basilica stairs. As always, thanks for sharing and Happy Valentine’s Day to you both! Thanks Barbie! Not sure when it will be…soon I hope as I do not care to do the climb in the heat of summer. We are truly enjoying spring-like weather and that helps lift the spirits! Maybe not what you planned, but still sounds like an awesome day. BTW, Gracia and I are in Palm Desert – forecast today is 90 F, sunny, with a light breeze … perfect! It was fabulous Will! We live in Rome!!!! I’m new to your blog, so you may already know about this, but just in case – since youre talking about less well-known places in Rome, you may want to include the Palazzo Doria Pamphilj museum. Right on Via del Corso, so not especially hard to find, A must-see, in my book. Oh yes, we know Galleria Doria-Pamphilj, Palazzo Colonna, and Villa Torlonia, among several lesser-known places in Rome. I did a post on such places a year-or-so-ago. Thanks, James, because some other readers will happen across this comment and go explore the hidden gems. Sometimes those days are the best. Where your plan turns sideways and you find something you didn’t know about. And there is the fact that this is THE Eternal City. If a person has to have extra time on their hands it may be the best place to have it. Amen sister! As they say, Roma una vita non basta! There’s always something to see or do.